Can you answer the questions on the U.S. citizenship test? 51. What are two rights of everyone living in the U.S.? 53. 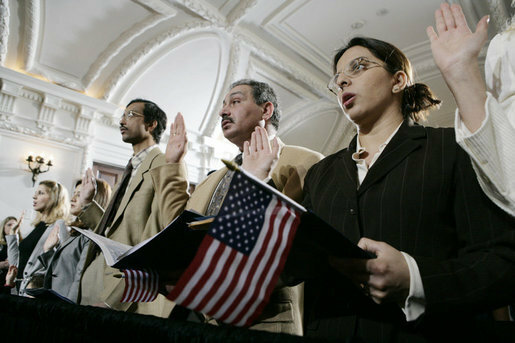 What is one promise you make when you become a U.S. citizen? 57. When must all men register for Selective Service? 71. Which territory did the U.S. buy from France in 1803? 85. What did Martin Luther King Jr. do? 86. What major event happened on September 11, 2001 in the U.S.? the War between the States; 74. Slavery, economic reasons, states’ rights; 75. Freed the slaves (Emancipation Proclamation), saved (or preserved) the Union, led the U.S. during the Civil War; 76. Freed the slaves, freed slaves in the Confederacy, freed slaves in the Confederate states, freed slaves in most southern states; 77. Fought for women’s rights, fought for civil rights; 78. World War I, World War II, Korean War, Vietnam War, (Persian) Gulf War; 79. (Woodrow) Wilson; 80. Franklin Roosevelt; 81. Japan, Germany, and Italy; 82. World War II; 83. Communism; 84. Civil rights movement; 85. Fought for civil rights, worked for equality for all Americans; 86. Terrorists attacked the U.S.; 87. Cherokee, Navajo, Sioux, Chippewa, Choctaw, Pueblo, Apache, Iroquois, Creek, Blackfeet, Seminole, Cheyenne, Arawak, Shawnee, Mohegan, Huron, Oneida, Lakota, Crow, Teton, Hopi, Inuit; 88. Missouri River, Mississippi River; 89. Pacific Ocean; 90. Atlantic Ocean; 91. Puerto Rico, U.S. Virgin Islands, American Samoa, Northern Mariana Islands, Guam; 92. Vermont, New York, Pennsylvania, Ohio, Michigan, Minnesota, North Dakota, Montana, Idaho, Washington, Alaska; 93. California, Arizona, New Mexico, Texas; 94. Washington, D.C.; 95. New York (Harbor), Liberty Island (Also acceptable are New Jersey, near New York City, and on the Hudson River); 96. Because there were 13 original colonies, because the stripes represent the original colonies; 97. Because there is one star for each state, because each star represents a state, because there are 50 states; 98. The Star-Spangled Banner, 99. July 4; 100. New Year’s Day, Martin Luther King Jr. Day, Presidents’ Day, Memorial Day, Independence Day, Labor Day, Columbus Day, Veterans’ Day, Thanksgiving, Christmas.